There comes a time in every man’s life when he must seek refuge from the stresses of everyday life. 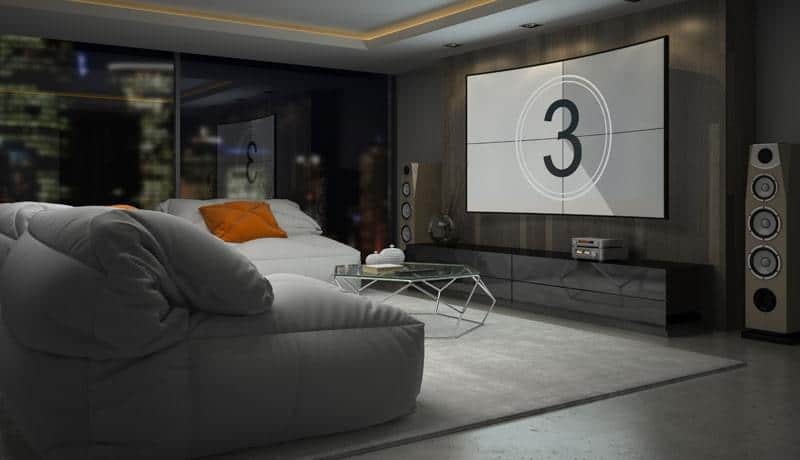 A room filled with your most prized and awesome possessions, your own personal sanctuary, one to escape into and away from the mundane – your very own man cave. As you are reading this, do you already have a room in mind? Perhaps the small room that is serving as a guest bedroom, absent of guests, storing rarely used items, items still too important to throw away. Well, now after constant back and forth with your significant other, you have been given the green light to make your man cave dreams a reality. But with so many options and do-it-yourself tips, it is important to make this space a personal getaway. Plan before going headfirst into your man cave. It is simple. Sketch your man cave ideas on a piece of paper. 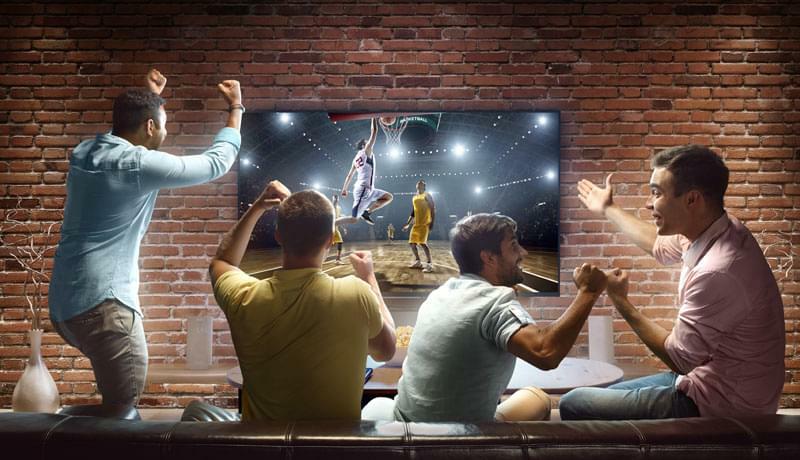 If the room is small, measure before purchasing that 80-inch 4K TV. The more you plan, the easier it will be when you are ready to furnish the room. Know what you want and fill the room with stuff you love. A 12-foot Marlin hanging on a wall might be good for the fishing enthusiast but not for the film buff. It is your room and it should reflect that. Choose an idea that best fits your style. If you have trouble getting started, there are numerous templates to help guide you. Remember, the decor you choose will separate your man cave from all the other rooms in the house. Here are a few cool man cave ideas to consider. Some of the best man caves have a modernized touch. Are you someone who keeps up with the newest trends? Love fine wine or collecting art? If so, you might want to build a wine cellar within your man cave. This way, you can have a glass of your favorite wine while relaxing in a stylish leather chair. To create a modern lounge, install a dark-stained wood floor. Use hanging ceiling lamps and stainless-steel appliances to spruce it up. You may also hang your favorite art. If you fancy, well, the fancy, express it through your man cave. Long gone are the days where a man cave needs to be overtly manly. It is your space. Let your personality shine through. When done, sit back and relax. Experience a five-star hotel lounge atmosphere in the comfort of your own home. This is a widely popular man cave idea and for good reason. Even small rooms can be turned into a comfortable and luxurious theater. 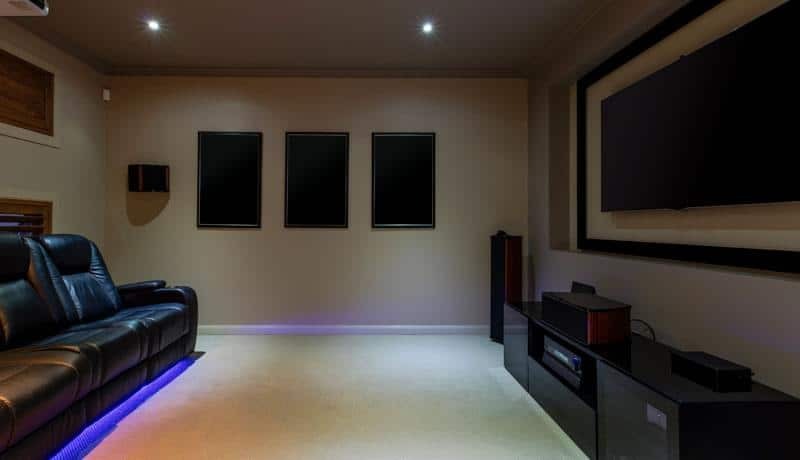 If possible, install a wall-mounted large screen TV or projection screen. Not having a TV stand will declutter the room and allow for a cleaner layout. Chose a wireless sound system. You do not want wires to become a main focal point of the room. Those pesky wires are not only unattractive, but they also attract dust. The chairs you buy can make or break this type of man cave. Reclining chairs are the most comfortable and most fitting for an authentic theater atmosphere. To create one of the best man caves, you need to personalize it. Frame posters of your favorite movies. Maybe set up a mini fridge and a snack station to heighten the experience. Do your best to eliminate the need to run to another room while trying to relax. This is perhaps the simplest man cave. 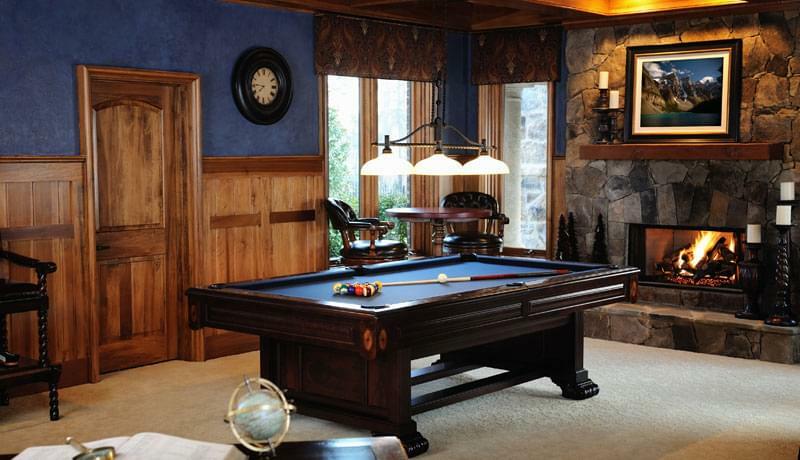 A card or pool table will do as the focus of the room. If you decide on a pool table, make sure there is room. You don’t want to play with a maestro baton like Kramer did in “Seinfeld.” This type of room is for and your best buds. Get their input. They should be comfortable, too. Make this man cave the man cave. Set up a small bar with assorted liquor and a cigar display. Spring for a humidifier to keep the stogies fresh and your friends feeling fresh, too. Install an adjustable wall-mounted TV. It will save space in a tight room and will allow everyone to have a great view. The sporty man cave is straightforward. It is obviously not for the casual fan. Fill the room with your favorite sports-related objects and memorabilia. Frame jerseys and hang them on the walls. Make it look like your personal hall of fame. Take that foul ball you caught as a kid, encase it in glass, and show it off to whoever you allow in your man cave. Maybe you want a sports-themed room but do not want to overdo it. Painting the room with the colors of your favorite team is not mandatory. Your man cave can be sleek and stylish yet still shows your fandom. Whatever you choose to do, have fun with it. And remember to get a high-quality TV. Antiques, collectibles, and prized possessions are a few things that catch the eye when someone walks into a room. Your man cave can center around a prized item. This “focal point” can be used to determine what other items and decor to include in your man cave. This idea gives you the most freedom to express your own personal flair. The item you choose to build your room around can be as unique as you. These are just a few examples of man cave ideas for a small room. What you choose is completely up to you but probably at least partially up to your loved ones, too. If you have many interests, incorporating multiple in one room can make for a cool man cave. Combine your love of film and sports. 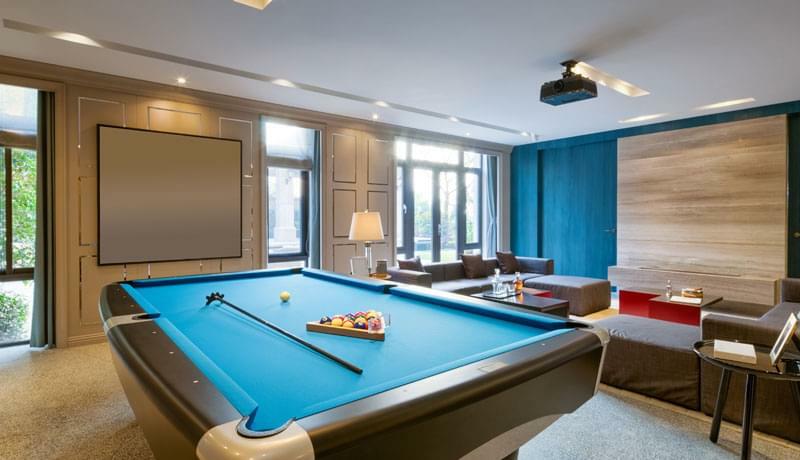 Put a pool table in your modern lounge. Whatever feels right to you is right for you. Now go ahead and get started on your dream. Remove the rarely used although sentimental items from your soon-to-be-perfect man cave. Yes, it is hard to let go of items filled with memories, but you don’t actually need to let them go. Instead, store them in a highly affordable storage unit at a Value Store It location near you.